According to the National Council on Aging, falls are the leading cause of injuries in seniors over the age of 65. One in four seniors falls every year, resulting in over 800,000 hospitalizations and 27,000 deaths. Falls can also take a mental toll. Learn why falls are so dangerous, then make changes to your senior loved one’s home to prevent them from occurring. Many seniors experience bone density loss with age. This change results in weaker, more porous bones, which increases the risk of developing a fracture after a fall. 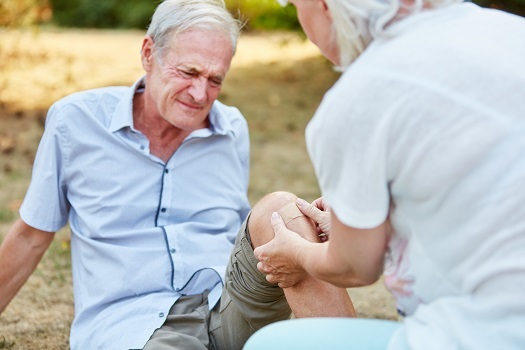 Seniors have a difficult time recovering from a fractured bone than those who are younger, and it may require surgery, extensive follow-up care, and physical therapy to ensure it heals properly. Families often take on the caregiving role to look after an aging parent with a broken bone, but there may be times when they’re unable to provide the necessary assistance. Family caregivers sometimes need a break from their caregiving responsibilities. When they need respite care, Huntington families can rely on professional caregivers to help their senior loved ones remain safe at home. Seniors are at an increased risk of isolation, and falls increase this risk. Not only are seniors likely to be housebound while recovering, but the fear of falling again may also prevent them from socializing once they’ve recovered. Lack of socialization can cause feelings of isolation, sadness, and loneliness. Every 11 seconds, a senior is treated in the hospital emergency room for injuries from a fall. If your parent breaks or dislocates a bone in a fall, it could result in surgical care and lengthy hospital stays. Staying in the hospital increases the risk of becoming ill due to germs, and the medical bills that result from a hospital stay may be a financial burden. Physical activity is just as important in the senior years as it is for children and younger adults. If your loved one falls, he or she may have a limited amount of physical activity while healing occurs. After your loved one has healed from the injuries, he or she may be too afraid of falling again to resume a normal exercise routine. Limited physical strength and mobility can have a significant impact on a senior’s quality of life. Seniors can face a variety of challenges as they age, many of which can be mitigated with the help of professional in-home caregivers who provide high-quality home care. Huntington families trust Home Care Assistance to help their elderly loved ones age in place safely and comfortably. Over 6.5 million adults over the age of 65 have depression, an emotional health condition characterized by lengthy periods of sadness that doesn’t go away, feelings of helplessness, weight loss or gain, and loss of enjoyment of normal activities. The symptoms of depression are often overlooked in seniors and dismissed as a normal part of aging. Falling may increase your loved one’s risk of becoming depressed due to an increased need to depend on others, loss of independence, feelings of isolation, symptoms of a head injury, or loss of mobility. Some seniors die as a result of a fall. The Centers for Disease Control and Prevention estimates that 41 percent of seniors who hit their heads during a fall and receive a traumatic brain injury die as a result. Other fall-related fatalities occur due to internal organ damage or secondary infections that develop during treatment. Injuries from falls are just one of the many serious health issues older adults are susceptible to, and they may need assistance at home to remain safe. Though some families choose to take on the caregiving duties, there may come a time when they need a trusted Huntington senior care provider. Families sometimes need respite from their duties so they can focus on their other responsibilities, and some seniors need around-the-clock assistance that their families are not able to provide. Home Care Assistance is here to help. To learn more about our high-quality senior home care, give us a call at (304) 521-2909 today.